I love that story. I’ve used it several times this year when I talk about risk-taking in leadership. It’s from the wonderful Bob Goff book Love Does, and in this chapter he shares stories about the adventures he took with each of his children, of their choosing, when they turned ten. We become so scared of “crashing” that we’ve stopped ourselves from embarking on the adventure. Adam reminds us, even with a big crash, it’s still worth it! I love adventuring. I’ve been an adventurer, and maybe even a bit of a wanderlust at heart, for quite some time now. I set off to Moscow State University in college. I moved to a law school I had never seen in a city I had never visited. From there, I studied in Oxford and traveled around Europe on the weekends. As a single career woman, I vacationed alone to places I wanted to visit. I drove around southern Alaska by myself for a week and had an interesting hot tub encounter with a moose one evening. I flew to the Cape one birthday month and explored the coastline, quickly developing a deep chagrin for the Massachusetts roundabout. My buddy and I tooled all around Italy via train for two weeks one Thanksgiving season, thoroughly enjoying the pasta marinara and gelato over turkey that year. In normal life, I’m a scaredy-cat, worry-wort. But put me on a plane, and I’m ready to go. 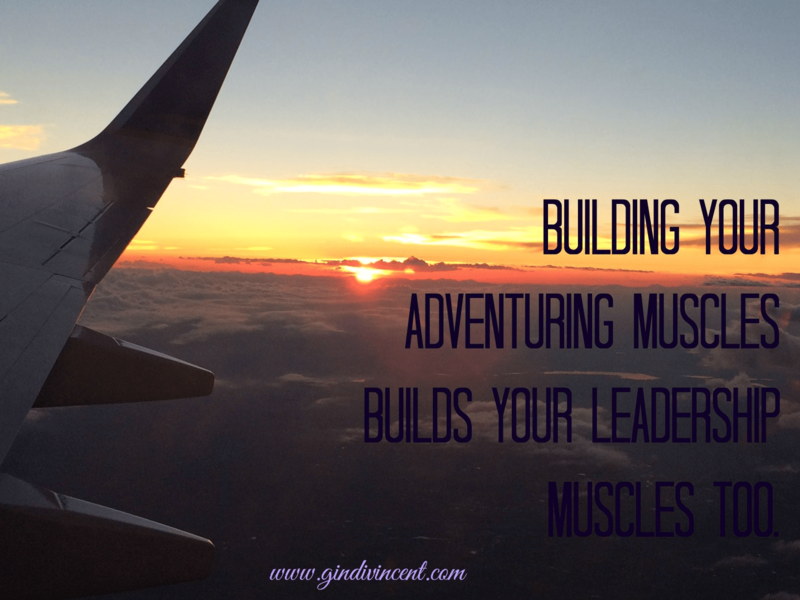 Building your adventuring muscles builds your leadership muscles too. Stepping into an environment or experience wholly unknown to you reframes your perspective and requires you to learn new things. It’s brave to try something brand new or go somewhere you’ve never been. Leaders have to be willing to move in a different direction, explore (and conquer) new territory, and appreciate the differences of their clients/ customers. What better way to cultivate a leadership sensibility than travel? I also want to encourage a thirst for adventure in my kids. We have maps hung next to our dinner table and a globe that talks to us, playing local music and describing culture and currency. I have one child in particular that begs to go on adventures from Russia to Africa. He asks, where is the furthest place we can fly mommy? When I respond, Australia, he excitedly proclaims, Let’s go there! I am committed to taking a one-on-one trip with a different child each year. While we can’t afford to jet off to Australia (yet, I’m coming Stella, just give me a couple years! ), we do explore new places and seek out new experiences. This weekend I fly with the baby to a spot in the deep South neither of us have been. We have a list of the Top 15 Things To Do in hand. Maybe we’ll do all 15, or maybe we’ll just do one and swim the rest of the time, but it’s certain to be an adventure in a new place with new scenery and new people. Maybe our adult brains, with all their schedules and routines, would benefit from an emphatic declaration to go to the furthest places we can imagine and try a fresh adventure on for size. I heard these lyrics and thought how apt they are for leadership lessons. I can’t even utter the words without cracking up now. There is no balance. But there can be BOTH. Or is often the enemy of progress or passion. What if companies asked, I can make money or I can give back to my community, instead of I can make money and I can give back to my community. What if women asked, I can have a successful career or I can raise a happy family, instead of I can have a successful career and I can raise a happy family. What if dreamers asked, I can have a job that pays the bills or I can follow my dreams and write/act/ sculpt/cook, instead of I can have a job that pays the bills and I can follow my dreams and write/act/ sculpt/cook. Saying and opens doors. Saying and allows you to do things you love while you function as a responsible adult. Saying and allows you lead effectively by example. No one should think saying and means you do the things on both sides of the and equation perfectly. But heck, even if you chose or your choices wouldn’t always be perfect. What does and mean? It means having a good handle on your priorities. If you add too many ands to the equation, then all of them take a turn for the worse. For me, that means if I want to take speaking engagements and write another book, then I have to make sure each yes response specifically furthers that goal because I do have two more BIG ands : my family (at the beginning of my and sentence) and my work. If I had said or it would have looked like, I can have a husband and three kids OR I can have a successful legal career OR I can speak and write professionally. Ugh! Think how much I would miss out on if I chose or over and! 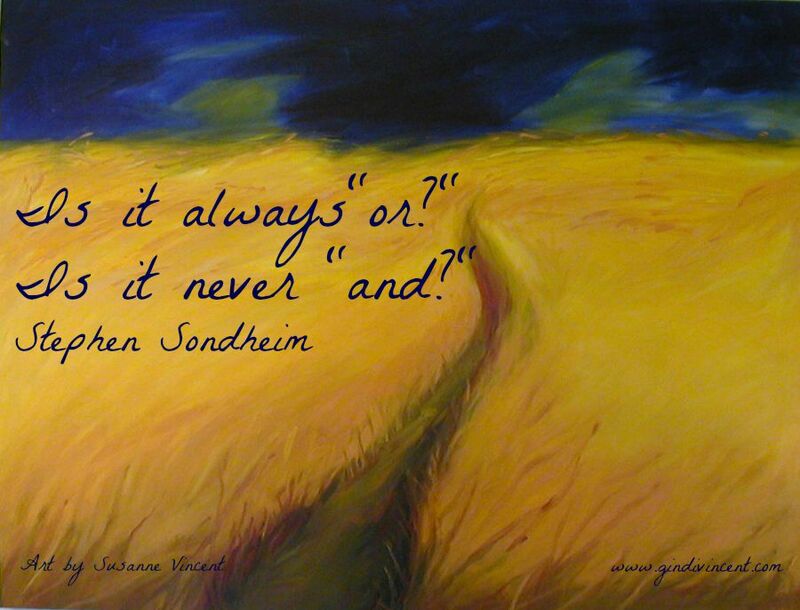 So next time you’re confronted with an and versus an or, don’t be afraid of choosing AND! Do you love to have hard conversations? Then you’re in the overwhelming majority of people (as well as almost every friend I have). I don’t like to have difficult conversations, but they are critical to both leaders and those aspiring to lead in their organization. I recently heard a career coach touch on this topic with great insight. One of the aspects she emphasized most was positioning the conversation as about the person hearing you, and protecting the company’s interests, versus any injustice you may feel you experienced. Therefore, if there’s a promotion you understood you would receive but didn’t, you don’t charge in at the peak of your emotions listing the ways in which you were wronged. Rather, after careful consideration and practice with a trusted advisor, you could share how you understand the company’s value proposition, and then identify how the decision could detrimentally impact an internal team or external client or marketplace perception. When you prepare for difficult conversations, and preparation with a business savvy sounding board is key, always begin with developing positive messages. It’s important to stay positive and calm and professional. Consider who you will be speaking with and what their key interests are. How you frame a message to a company President will be different than when you’re speaking with a team staff member. Align your interests with your audience and the company. For example, if a long time contractor used sexually inappropriate conversation, then you are responsible for having a conversation with both the contractor and, if you are not the supervisor, the boss. Highlight you are having the conversation because you want to protect the company’s reputation and their core values. Raise the issue in a one on one setting so the recipient of the advice is less likely to jump to a defensive position. and often hedge their statements when they do. I recently heard a woman encourage others to develop positive habits. 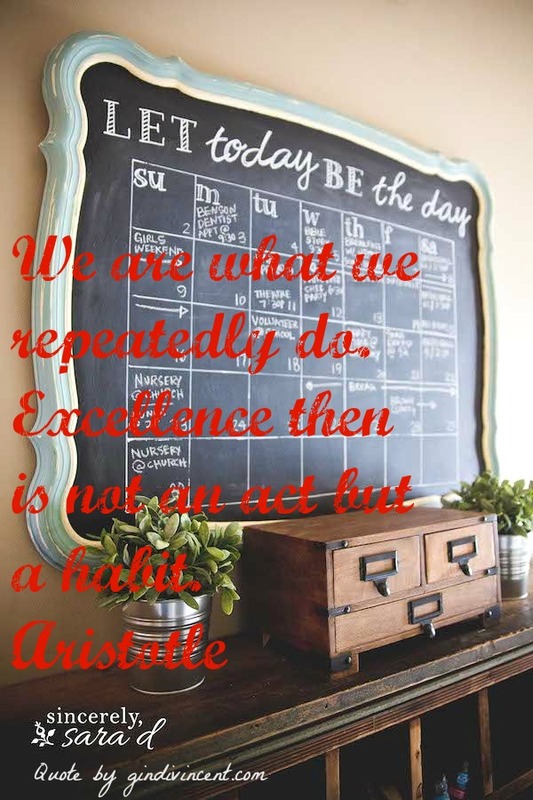 Then she used this quote by Aristotle. I don’t know about you today, but that is encouraging. Leadership strengths can improve each year if you cultivate those skills. If you develop habits that encourage positive and clear communication, goal setting and retooling, mutually beneficial relationships with your peers and those at all levels in your life and organization, consistent alignment with your life values and vision, and giving back to others around you, then you will be known for excellence. Not because you are putting on an act, but because you have remained committed to a life of habits that improve your skills and abilities as well as those around you. That’s the entire title of the speech I’ve been giving this past month as I travel. How? Because He’s got it. The Bible is clear on this point. All the stuff, the external metrics we’re so obsessed with living up to every day even though they keep changing, becomes irrelevant in light of the Scripture. Once the measuring stick is gone, it’s tremendously freeing for a leader. I couldn’t be free, or brave, without the cornerstone of my faith. 1. We are His work. 2. He created us to do good works that He already has PREPLANNED. 3. And He will carry out His good work in us. External forces will always tell us there is a new barometer by which we must measure success. Right? Facebook changes its publicity policy faster than anyone can track. The networking technique of today turns changes to the branding yourself tool of tomorrow. That six figure salary won’t put a single kid in private school while you juggle your mortgage and car payment. The money is never enough. The promotion doesn’t buy satisfaction. The plastic surgery, social media, luxury handbag or SUV, the front page headline, the publication, the big award, they never provide freedom. They just provide more pressure. To do the next big thing. To surpass your last achievement. Endless freedom. Stable assurance. They form the foundation for a lifetime of brave leadership. He wants you to see that you are beautiful and loved and forgiven and a conqueror because HE created you. 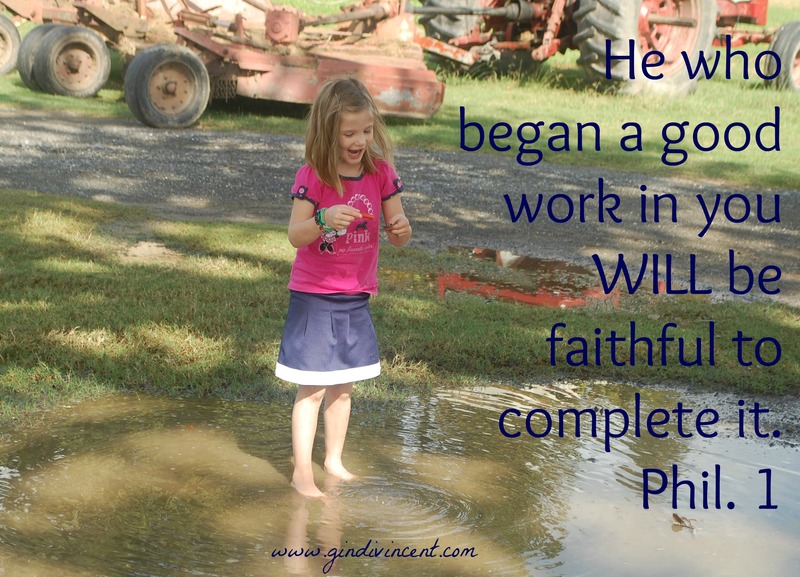 Then He will carry out that good work to COMPLETION. That’s right, all those good works will be done beyond anything we could have imagined for ourselves (Eph. 3) because He’s doing it. We just have to go where He says. Do you know how bravely you can lead when the pressure is off of YOU? The pressure is on Him. You just get to say, “okay, let’s roll,” and everything else is up to Him. We follow where we’re supposed to go even if it feels NUTS. Even if it’s antithetical to the way everyone says we’re supposed to do it. The world says, “write a blog about only one topic if you ever want to succeed.” God says, “mmm, no, I want you to write about a dozen things, none of them related, and any one of which might turn off the people who read the other thing.” Crazy, right? But SO freeing. The world says, “speak more and more and take the bigger promotion and salary and do it bigger and bolder.” God says, “why don’t you just stay quiet for a while, and wait on the promotion, and hang out with neighbors instead.” Are you kidding me? Oh, but how much more fun is it to do it the crazy way. If are ready for a wild brave leadership ride, then spend a little time each morning asking God those simple questions and then head out wherever He leads. It will be scary and fun and nerve-racking and breathtaking and unexpected. He’s leading, so we can be brave!